Inside: Have you heard that moms can make money blogging, but you have no idea where to begin? 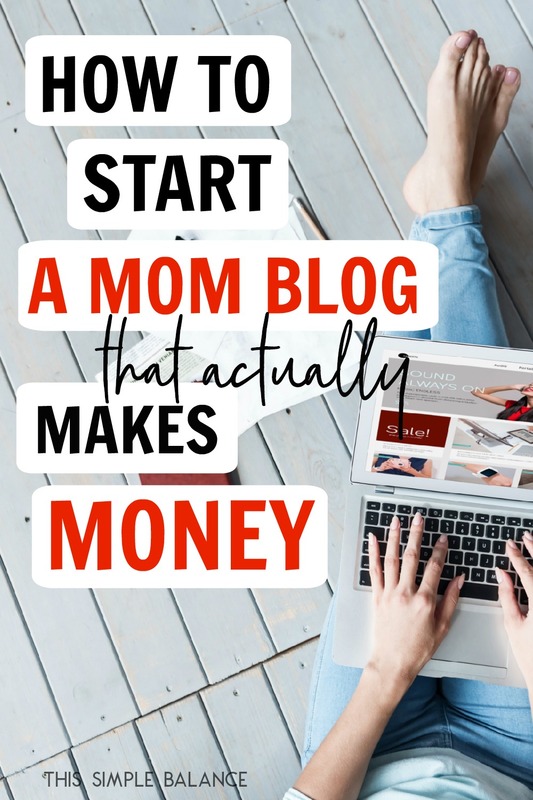 Get step by step instructions for exactly how to start a mom blog that actually makes money (many blogs don’t), along with information about blogging that I wish I had before I started. Three years ago, I learned that you could actually make money blogging. 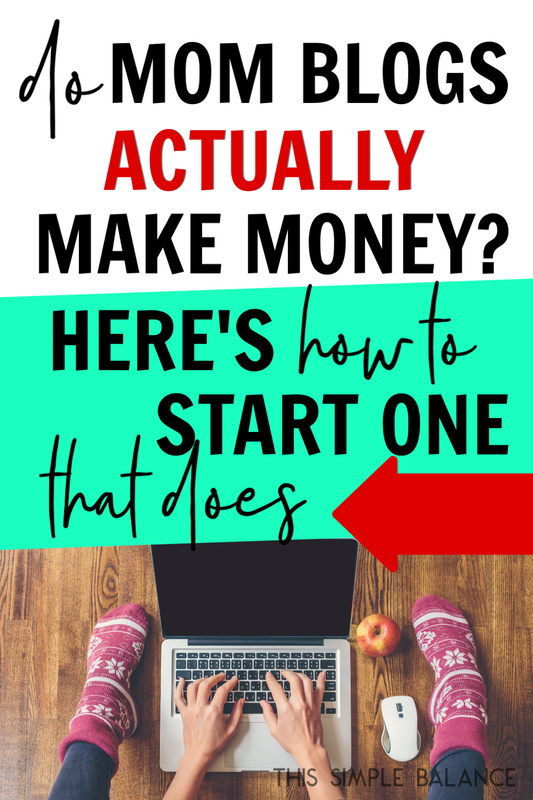 One of my favorite mom bloggers mentioned in a random e-mail that she had finally learned how to earn a part-time income from home through her blog. She started her mom blog as a hobby, having no clue it could pay her bills. Five years later, she consistently earns $2,000 a month. Without her telling me it was possible, I wouldn’t be earning money blogging today. How I wish I’d known sooner! It’s not too late to start a mom blog and make money from home. You’ve heard that you can make money blogging, and you think you might be good at it. But you’re stuck on those two points, and trying something new is just too intimidating without the answers to those two questions. Enter: this post. I’m going to answer both of them! (and a few more you might be asking). But first: what did it take for me to overcome my fear and actually start a mom blog? 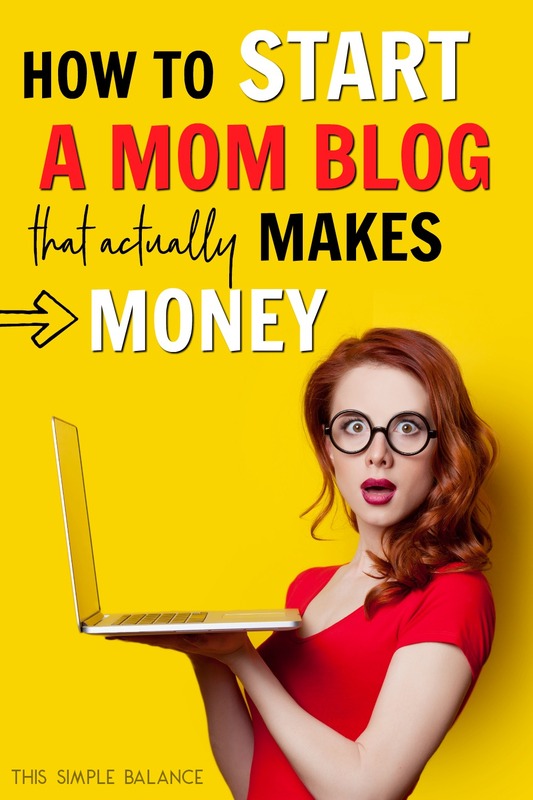 A year after I first learned that you could make money blogging, I came across another mom blogger who was making serious money blogging. $2,000 a month was cool, but her numbers really caught my eye. What do I mean by serious money? $20,000 a month kind of serious. As soon as I saw that number, my curiosity shot through the roof. I read everything I could find about how bloggers actually made money. After all that reading, my basic understanding was that mom bloggers earned money by recommending products they loved and sharing helpful tips with other moms. I already did that all.the.time. Is Blogging a Good Fit For You? Why Start a Mom Blog? How Much Money Can You Earn as a Mom Blogger? What Types of Blogs Actually Make Money? How Do I Start a Mom Blog? What’s Next After I Start My Mom Blog? If you want to skip ahead at any point, feel free to click one of the links above to the topic that interests you most! Before you read any further, take a second to think about whether blogging is a good option for your personality. Because blogging requires perseverance, you do need to enjoy blogging at its most basic level in order to keep going. Are you constantly telling your friends about the products you love? Do they often take your recommendations? Do you love telling other moms tips and tricks that have made your life easier? Do you enjoy solving problems? Giving people tangible, actionable solutions to their problems? Would you enjoy doing all those things, even if you weren’t paid to do them? If you answered yes to all of those questions, then like me, starting a blog could be an ideal way for you to earn a legitimate income from home. I can’t tell you how thankful I am for blogging! When you blog, you don’t report to any boss but yourself. You can work as much or as little as you want depending on your family’s needs and schedule. You earn money while you’re at the park with your kids from posts you wrote six months ago. What kind of job allows you to earn money, even when you’re not actually working?! It’s unreal, and I honestly don’t think you could ask for a better part-time job (which could eventually become full-time earnings for part-time hours). It takes serious work to get your blog to that point, but once you get there, there’s really nothing like it. I started with pie-in-the-sky income goals (based on the $20,000 a month mom blogger). I was going to pay off the rest of our student loans in a year. I had plans to retire my husband in two. I didn’t realize at the time that the percentage of bloggers earning that type of income was miniscule. In fact, somewhere between 90-99% of bloggers quit within a year of starting (often within six months), often because they make next to nothing. With a LOT of blood, sweat and tears (yep, there were a lot of tears last year), I readjusted my earning expectations. After changing my expectations, I finally reached my new 2018 income goal of $1,000 a month less than a year and a half after starting my blog. I believe that with perseverance, creativity, and a solid blogging education, most mom bloggers can achieve this level of income. Some mom bloggers can and will go beyond this level. I plan on doing so, but I now recognize my limitations. With my family size and responsibilities (I have soon-to-be five young children, and I homeschool), in addition to the income levels of my target audience, I know that growth will take time, and my growth might be slower than others. I’m *finally* o.k. with that. As far as earning potential, the best thing about blogging is that the sky really is the limit. I know mom bloggers earning anywhere from a steady $2,000 a month to the $10,000 a month. Beyond $10,000 a month is not the norm, but it’s definitely possible. The most successful bloggers I know never stop learning. Learning the ins and out of the blogging world was like taking a semester worth of college courses. And unlike other fields, the blogging industry changes quickly. You need to commit to persevere and learn through all of the changes if you’re going to succeed. How Do Bloggers Earn Money, Anyway? Bloggers earn money in a variety of ways, and the longer I blog, the more I learn about different ways to make money through your blog. However, these income streams are the five main ways bloggers make money. Advertising is probably the easiest way to make money blogging. However, it does take a significant number of people reading your blog to make good money with ads. Many bloggers start by using Google adsense – I did. However, I made pennies per day with adsense. Once I hit a certain number of monthly sessions (times a single person visited my blog), I applied for Mediavine, an ad network that takes care of all of my ads and pays significantly more than Google adsense. For context, when I had Google adsense, I earned $100 for approximately a 38,000 session month. With Mediavine, I earn anywhere from $550-750 for the same number of sessions. Affiliate marketing is simply selling other people’s products. You have probably clicked on product links while reading your favorite blogs. If you buy something after clicking that link, the blogger will usually earn some kind of commission. The amount you earn per purchase will depend on the affiliate program, and when the person who clicks the link actually buys the product. Amazon affiliates, for example, pays less than 10% per purchase. Fellow bloggers who create physical and digital products themselves often have more generous affiliate programs, offering anywhere from 20-50% of the purchase price. Earning money through affiliate marketing will depend on the trust you build with your readers, your enthusiasm for the products you promote, and whether or not the products you write about solve problems for your readers. Companies are relying more and more on influencers (i.e. bloggers and social media marketers) to raise awareness about their products. Think about it: how much more likely are you to try a new product based on a friend or favorite blogger’s recommendation than if you saw a random ad on a website once or twice? For that reason, companies are willing to pay a lot of money for you to recommend a product through an Instagram post or naturally within the context of a helpful blog post. The amount you can earn per sponsored post will depend on the size of your audience (monthly visitors, e-mail list size, Instagram followers, etc.) and your ability to develop a strong relationship with the company/brand. Some bloggers develop ongoing relationships with specific brands who reach out to them directly. Other bloggers find random sponsored post opportunities through third-party networks that facilitate an application process for each post opportunity. Still other bloggers approach companies directly because they already use and love their products. They share their follower numbers and make a specific pitch to the company itself. 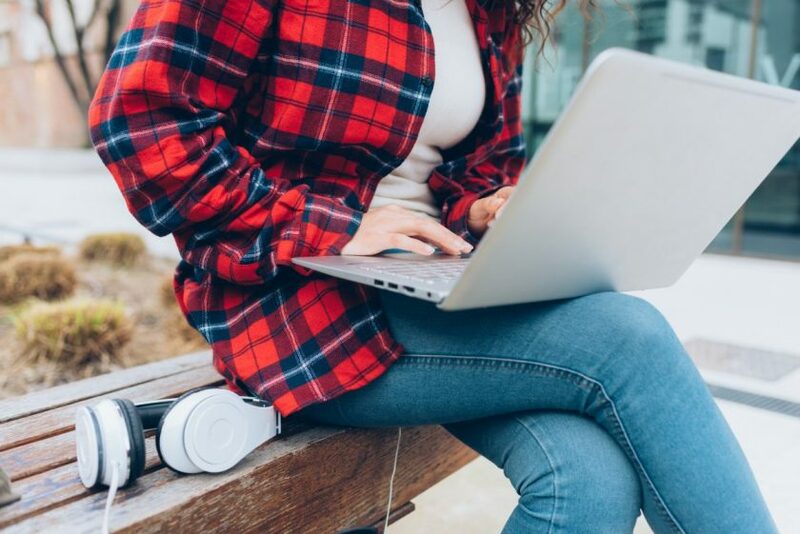 Because it can take a while to make money blogging, many mom bloggers supplement their blog income by offering a variety of freelance services. The more you learn about blogging, the more services you will be able to offer. The services you are able to offer will depend on your current skills and those you acquire as you learn the blogging business. Many bloggers outsource necessary blogging tasks that are time-consuming with low ROI in order to focus on the tasks that will earn them more money faster. Networking and quality work can help build your service-based business faster. 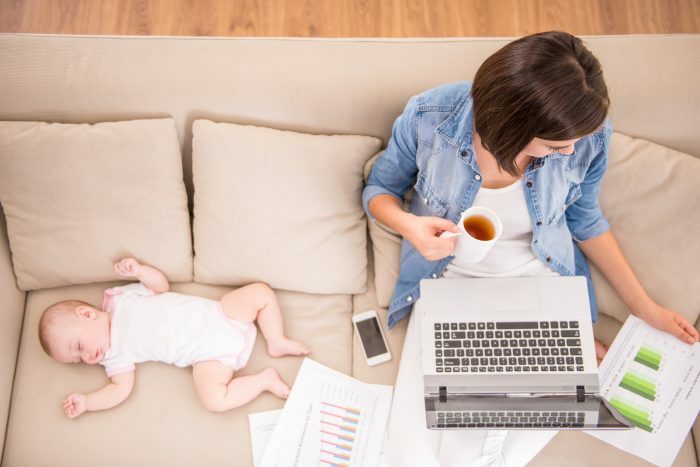 Some mom bloggers end up loving freelance work as much as, or more than, building their own blog, and they decide to focus the majority of time on services. Many bloggers swear by creating and selling your own products. Products come in all shapes and sizes, although digital products seem to be the most popular because you don’t need to worry about shipping and handling. Really, the sky is the limit. The trick is figuring out what your audience needs and wants in order to not waste time creating products nobody will buy. Many bloggers repurpose posts they have already written on their blogs. They edit, reformat, and add to it and turn it into an e-book or course. If you decide to sell physical products, you will need to either outsource the shipping and handling, or learn the best way to quickly package and ship products to customers. What Types of Blogs Make Money? Years ago, blogs were more like online diaries. They existed to keep in touch with loved ones or to share interesting thoughts and ideas with family and friends. Very few bloggers can earn income from sharing this type of content. What kinds of blogs make money? Blogs that solve legitimate problems. The clearer you are about the problem you are trying to solve in each and every post, and the better the solution you offer, the more you more likely you are to make money from people reading your content (viewing your ads, joining your e-mail list so you can promote your favorite products to them) and buying the things you recommend (affiliate marketing or your own products). In order to earn money blogging, you need to be writing content that solves a problem for your readers. Solving problems can look very different from blog to blog, however. You might provide a round-up of helpful posts from other bloggers who offer different advice for the same problem. You might teach your readers how to declutter their bathrooms. You might answer a question that many people are asking, but no one has given a clear answer to. You might create a list of Christmas gifts for kids that will actually last for more than a few months. You might help moms stop feeling guilty for letting their kids watch too much t.v. Whatever you write about, your blog needs to solve problems for people. Unless you’re a celebrity, people want to read your blog because it helps THEM. You can and will still share parts of your life and experiences throughout your posts. That’s part of what will set you apart from the crowd of mom bloggers competing for readers time and attention. But ultimately, you need to write posts with your reader in mind. You can earn money blogging about pretty much any topic, as long as you are solving problems for people related to that topic. We finally made it to the good part: tell me how to start the blog already! So, you’ve decided you actually want to do this thing. You’re going to overcome your fear of failure, you are going to take the leap. You’ll actually be surprised at how easy and fun it is to start your blog. The hard work comes later. Get out a piece of paper and jot dot everything that comes to mind in those three areas. If you are tempted to write something down, but think it’s too insignificant, write it down anyway! We often undervalue the things we know how to do or what we’re really good at simply because it’s second nature to us. In reality, all you need to be is a step ahead of the person who wants to learn how to do what you already know how to do. One step ahead of someone else in your area of passion or expertise. That’s it. Once you’ve written down everything that comes to mind, brainstorm a few different post ideas under 2-3 topics that interest you the most. If you feel like you could never run out of blog post ideas, you’ve probably hit on at least one of your blog’s topics. You also want to be sure to run by any strong options by another person before you go for it. 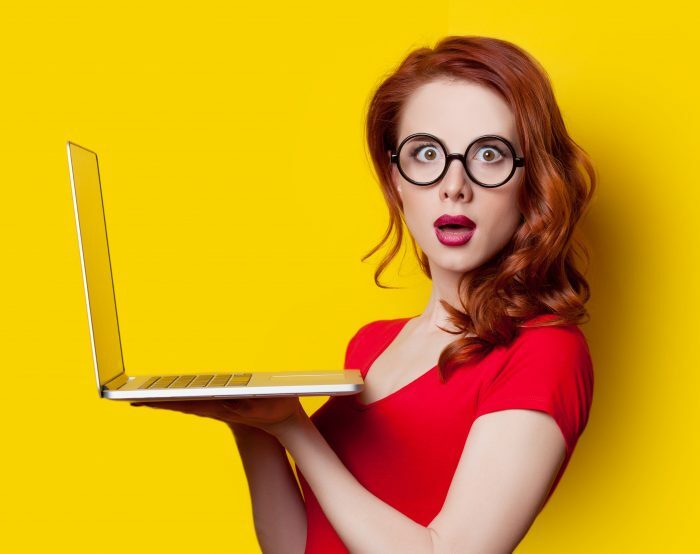 A blog name could sound great to you…until you run it by a friend who asks what on earth you’re going to write about with a blog name like THAT. Sometimes when you’re first starting, you aren’t sure what your strongest topics are going to be. In that case, you will need to gear your name toward your target audience, instead of the actual topics. If I could go back, I probably would have included the word “minimalist” or “minimalism” in my blog name (you’ll learn later how this can help people find your posts through Google). However, when I first started, all I knew was that I wanted to help moms simplify their lives and find that ever elusive balance. I had no idea how much over time I would identify as a minimalist. I chose to use the word “simple” in my blog name instead, and for now, it will have to do. These can be complicated to understand at first if you don’t speak tech. I certainly had trouble understanding it all when I started my blog. Hosting is where all your blog data will be stored: your posts, your images, your links. They help determine how fast all that data loads for your readers. That’s why hosting is SO important. Had I realized how important hosting is, I would have researched different hosts before choosing Bluehost. There’s a long, wretched story I won’t go into now, but the long and short of it is that Bluehost broke my blog. Even before they broke it, it was running incredibly slow. If you’ve ever clicked on a blog post through Pinterest or Google and gotten nothing but a loading sign for more than a few seconds, you know how important site speed is. Because what did you, as a reader, do? You clicked away, am I right? You found another post on a different blog that could actually load in a few second as opposed to 10-12 seconds. While there are other things that can affect your site speed, hosting plays a big role in how quickly your site loads for your readers. You want fast. I switched to Siteground, and not only did they fix my site for FREE in a matter of seconds (Bluehost said I would need to pay someone), but my blog loaded so quickly, I couldn’t believe it. It was night and day different, which is why I highly recommend Siteground. Their customer service and site speed are excellent. 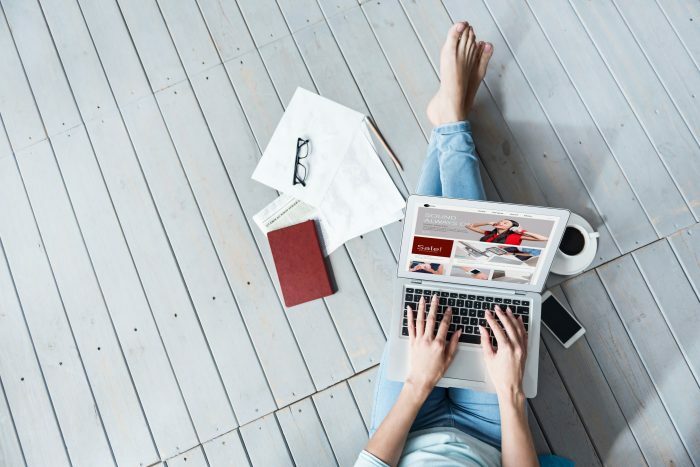 As you grow, you may eventually need to move to a new host that can handle higher pageviews, but for a new blogger just starting out, Siteground is the way to go. The platform you choose is the software you will use to write your posts, upload your images, and change how your site looks stylistically. WordPress is the most recommended platform by bloggers because it’s the easiest to customize. Because WordPress is the industry standard, it will be the easiest platform to learn because free information, tutorials, and paid guides on how to use it are plentiful and easy to find. You DON’T want to start a blog using wordpress.com. If you start a blog there, you won’t actually own your site. It will be free, yes, but they can shut down your blog at any time, for any reason: mistake or no mistake. All your hard work can be gone in an instant. WordPress.org is what bloggers refer to as “Wordpress”, the platform you will use to actually write and publish your posts. Once you actually sign up for hosting with Siteground, you will be able to go into your account and download the WordPress software. WordPress.org will be the only available option (and the correct one!). After you click this link, you should see a screen like the photo below. Next, you need to choose a hosting package, which vary in size based on the number of visitors your site can handle on a monthly basis. The main difference between each package is the amount of data you can store and the number of visitors your blog can receive without slowing down your site. The first two packages – “Startup” and “Grow Big” – are generally the best options for new bloggers, as it will take you a while to increase traffic (the number of visitors) to your website. To give you an idea, it took me five months to outgrow my initial plan -comparable to the StartUp Plan – that could handle about 10,000 monthly visitors. 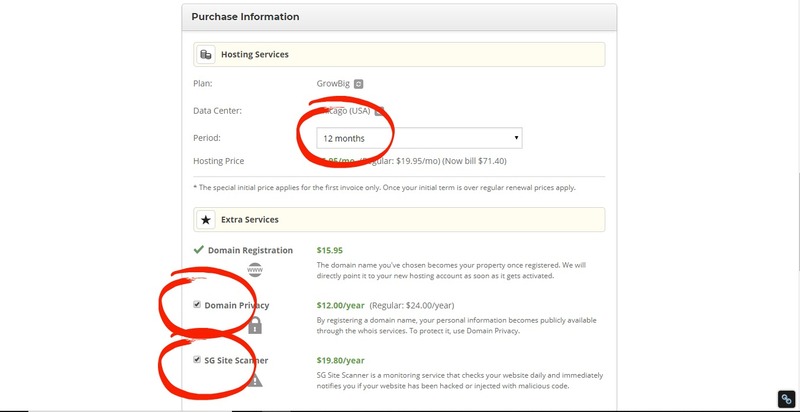 Keep in mind when you choose that you will have the option to purchase 12 months, 24 months, or 36 months of hosting. 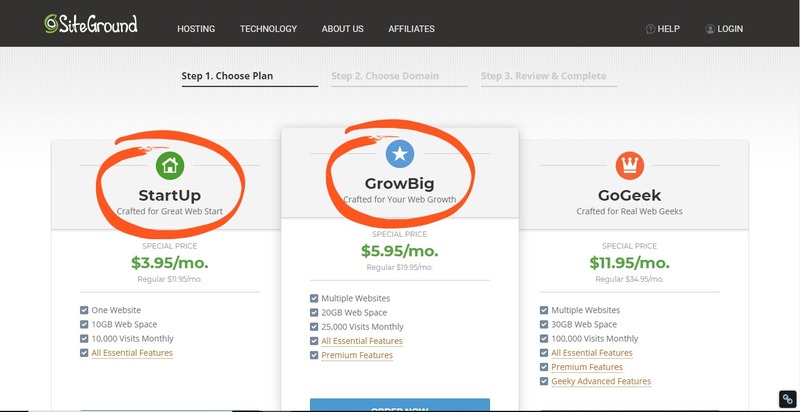 If you are truly serious about blogging, I recommend choosing the Grow Big Plan and purchasing 24 or 36 months of hosting. One year is just not enough time in my opinion to see steady, significant income (at least not enough to make you confident in purchasing another full year of hosting at full price). Buying 2-3 years up front is a great deal and will give you time to increase your income to cover your expenses. If you’re balking at the number on your calculator after doing the math, let me ask you this: what other business can you start for less than $200-$300? If money is *really* tight (been there! ), go with the StartUp plan and 12 months. Once you select your plan, it’s time to choose your domain name. Go back to the blog name you chose in step two, and see if it is available using the “.com” version. If the name you chose isn’t available (boo! ), you will need to rework your original idea. You might be tempted to choose a different extension: .net, .me, .org. However, readers typically assume the “.com” extension, and you don’t want any more obstacles for them to overcome to get to your blog. Try shifting words around, adding “this” or “the” to the beginning or “blog” to the end. Try not to add punctuation, as it makes it more difficult to remember. Choose your domain name wisely, but don’t obsess over it. At the end of the day, starting is better than stalling over a name. Scroll down the page and fill out your personal information. Under “Hosting Services”, I recommend choosing 24 or 36 months. As I said before, if you are serious about blogging, you need to give yourself 2-3 years to see a significant part-time income. If I had chosen one year, I very well might have quit, instead of renewing hosting to the tune of $240. At that point, I was only earning around $200 a month. A few months later, my income quickly shot up, and I reached a consistent $1,000 a month, five months later. Give yourself enough time to make this blogging thing work. You are also going to want to check the box next to “Domain Privacy”. This will protect your name and personal information from solicitors and spammers. The SG Site Scanner is optional, but I also recommend it because it scans your site for malware. Take advice from someone whose blog broke – and all my hard word flashed before my eyes – the extra peace of mind is worth the relatively small additional cost. Once you’ve selected all the options and filled out all the required information, finish checking out. After you’ve finished the check-out process, you will receive an e-mail from Siteground with your account log-in information and instructions for how to install WordPress. 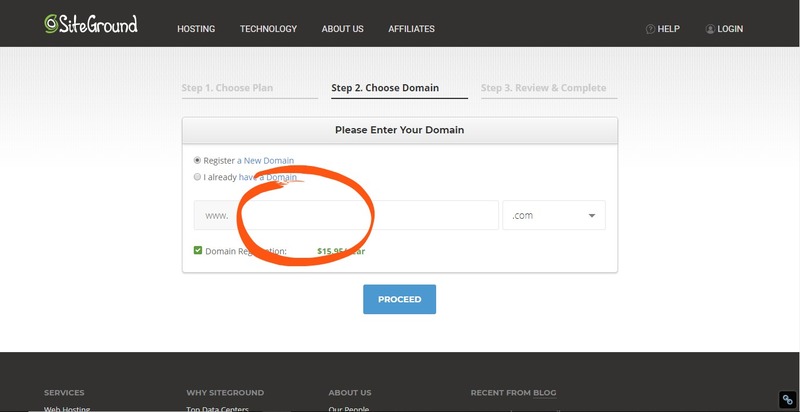 Once you log in to your Siteground hosting account, you should see the option to “Start a New Website”. Click that link, and choose WordPress as your platform. The Siteground Wizard will walk you through how to download and install WordPress. After WordPress is installed, you will need to choose a theme. The theme is what determines how your website looks to readers when they arrive. To get to themes, highlight “Appearance” in the left-hand sidebar of WordPress, and click on “Themes”. You can pay for a theme if you want, but a free theme is a great place to start. It will take a few months of blogging to know what your long-term wants and needs are as far as design goes. Whatever you do, make sure to choose a mobile-optimized theme: one that will conform to the size of a mobile phone or tablet. I made the mistake of buying a non-mobile-optimized theme when I started, and as a result, my site doesn’t look as professional on mobile phones, which is how most of my readers view my blog. What’s Next After I Start a Mom Blog? Congratulations! You’ve started your blog. Your immediate next step is to familiarize yourself with WordPress. There is a setup wizard which can walk you through the basics. After that? You’ll need to learn all about things like plugins and headers and pages. Do those terms sound scary to you? Yeah, they certainly scared me. You can go the DIY method for learning how to do all those things, which is possible. You can find a lot of free information online. I learned WordPress and many other blogging basics by myself with A LOT of googling. I would have saved so much time if I had purchased an inexpensive blogging course or two. I understand blogging on a tight budget – believe me! That’s why I wrote this post with all my recommendations for affordable blogging courses for beginners that can cut your learning time in half. I’ve taken more than the courses listed, but to be honest, many of the pricier courses weren’t worth the money. I cannot stress enough that you need to invest in your blogging education. Almost all of my earnings my first year went back into my blog, and I don’t regret it. Join as soon as you can, and don’t be afraid to sound stupid with your questions! If you don’t ask, you won’t learn. Be sure to reach out with any questions using this contact form, and I will try to respond as soon as possible. I’m rooting for your blogging success! This is such great info! I’m thankful for your transparency and pointers. Hey June! Thanks for the shoutout! We’re so glad to have you as a Mediavine publisher and are proud to play a part in your success.